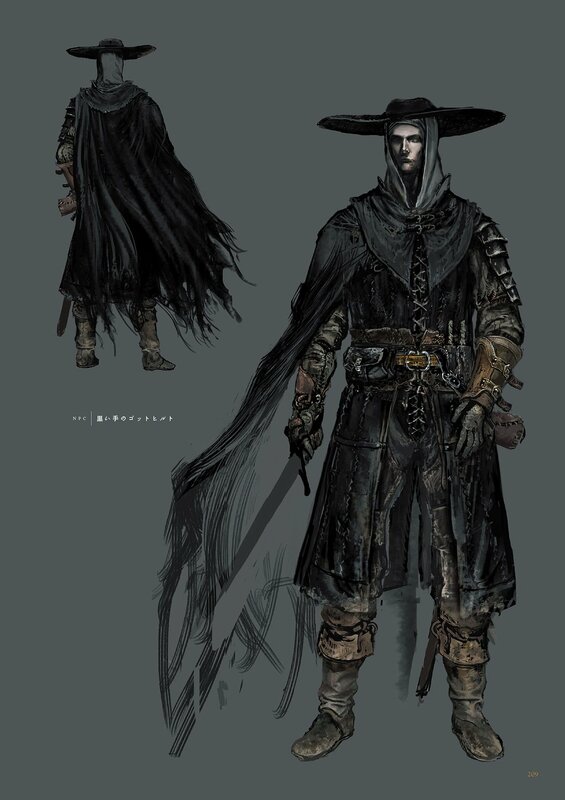 Black Hand Gotthard is a NPC in Dark Souls 3. Example Video when summoning him for his gesture. Abyss Watchers: Summon sign is located near the top of the staircase that leads to the boss. Pontiff Sulyvahn: Summon sign is located in front of the entrance to the boss, between the two praying statues. Found dead at the entrance to the Grand Archives, granting you the Grand Archives Key and the Gotthard Twinswords. He is not there at the beginning of the game. His corpse will appear after Abyss Watchers, Yhorm the Giant, and Aldrich, Devourer of Gods, have all been killed and the cutscene turning the sun into an eclipse has taken place. This assures that you cannot proceed into the Grand Archives until the 3 Lords have been defeated. If you've killed the first 3 Lords but his corpse still doesn't appear, try teleporting to the Aldrich, Devourer of Gods bonfire and the cutscene that teleports you to Emma should trigger. Although he can be led to the Crystal Sage, he cannot enter the arena. The body has the sheath of Onikiri and Ubadachi, so the corpse might not be Gotthard's. This guy is absolutely amazing. He saved me from so many death by Abyss Watcher combo by staggering him everytime the Watcher was going to coup de grace me into a second early grave. FromSoftware, please remove blinking eyes on corpse, it’s ruining my immersion. Do it or I swear I’ll leave a bad steam review!! Gotthard is a baller - in my experience he hasn&apos;t come close to dying once and seems to have semi-intelligent AI as during Abyss Watchers his aggro was fixed on the "true" boss. I came across his summon sign in my first play-through, but his goofy last name made me think he was a player character, not NPC. This dude just shows up for business. No Sunbros? No problem. Why is he dead before the grand archives? So has anyone figured out why his corpse has Onikiri and Ubadachi on it? Since I didn&apos;t see Sirris&apos; sign at the Abyss Watchers fight, and I wasn&apos;t going through Anri&apos;s questline, Gotthard was my go-to summon for the Watchers and Pontiff. I don&apos;t know if how competent he is depends on how much of a casul you are (I think I&apos;m in the filthy category), but he helped my strength character whittle them down before I smashed them. That being said, I ended up soloing the Watchers because I ran out of Embers, and he didn&apos;t live through the Pontiff fight, but I&apos;m still holding on to his twinswords. My theory is that he asked by Emma to help those who were hunting down the Lords of Cinder. He chose to do this, feeling that his duty to his kingdom was greater than his duty to the princes (which put him at odds with Kamui). He came to help with two of the most essential fights in the Unkindled&apos;s journey, and, upon watching their defeat of the resurrected Lords of Cinder from the shadows, Gotthard went back to Lothric Castle to unlock the Grand Archives. However, in the time that he had been gone, the Pilgrim Butterflies appeared, and animated the Dragonslayer Armor. He managed to get past it, but he expired shortly afterwards. He cannot be summoned for Abyss Watchers if you&apos;ve already summoned Londor Pale Shade. You must have the wolf of farron covenant equipped for his sign to show up outside the abyss watchers. I was unable to summon him for the Abyss Watcher fight while Yellowfinger Heysel was summoned, his summon sign wouldn&apos;t show up. I tried restarting the game, teleporting from bonfire to bonfire, and even dying and re-embering to no avail. I started a new game and made a new character. I did every same thing during my previous playthrough but his summon sign is gone this time around. I only got to summon sirris for the abyss fight. Are there requirements now for him to appear??? WHY IS HIS NAME GOT HARD?????? Cutscene turning the sun into an eclipse? Huh? When did that happen?